Do you want to increase your strength and are you looking for a more advanced creatine than creatine monohydrate? Would you like for this scientifically advanced formula to include a bonus? Crea-Tech PX9 is the solution! Developed by All Stars, Crea-Tech PX9 is much more than a simple creatine formula. The combination of Creatine MagnaPower and Creapure leads to a drastic increase in strength, allowing you to lift heavier weights in each repetition and break new records. All of this in easy to swallow capsules with fast release for fast results! Crea-Tech is much more than a basic creatine supplement. It's a supplement that allows you to increase strength, train better and longer, recover faster and maintain a strong immune system. You'll see the results. Have a question about Crea-Tech PX9? What is it, what does it do, how and when to use or something else? Ask us. 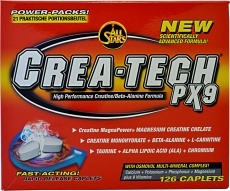 “All Stars Crea-Tech PX9 126 capsules - Opportunity” is currently out of stock. Enter your details below and we will let you know when it's back in stock. “Crea-Tech PX9 126 capsules” is currently out of stock. Enter your details below and we will let you know when it's back in stock. On workout days take 6 Rapid Release Caplets (1 Power-Pack) Crea-Tech PX9 before workout (pre-workout) or immediately post-workout. On OFF-days take 6 caplets before breakfast. Consume with a large glass of water (300-500ml) or to improve its effectiveness, take Crea Techwith a large glass of fruit juice (e.g. grape juice) or a carbohydrate drink. WARNINGS Crea-Tech PX9 : Do not exceed recommended dosage. Keep out of reach of children. These statements have not been evaluated by the Food and Drug Administration. This product is not intended to diagnose, treat, cure, or prevent any disease.